The Monadnock Center connects residents and visitors to the history and culture of the Monadnock Region of New Hampshire. The Monadnock Center for History and Culture preserves and celebrates our region’s past, enriches its present and shapes its future. The Monadnock Center’s events and exhibits explore and share our region’s rich history. Its programs, concerts and events enrich cultural life and promote thoughtful discussion and connection to the region. The Monadnock Center welcomes everyone. The Monadnock Center collaborates with community partners to build the social, cultural and economic vitality of the region. The Monadnock Center presents quality exhibits and programs that are relevant to and highly regarded by the community. The Monadnock Center believes a shared sense of the past is the foundation of a strong community. The Monadnock Center protects and stewards its historic buildings and collections for the benefit of the community. Located in the heart of Peterborough, with close proximity to restaurants and shops, the Monadnock Center also houses a visitor’s center, affiliated with the Greater Peterborough Chamber of Commerce, where tourists can find information about businesses and other cultural organizations in the downtown area. The Monadnock Center for History and Culture is a tradename of the Peterborough Historical Society, a 501-C3 not-for profit organization. The Society was founded on February 2, 1902. 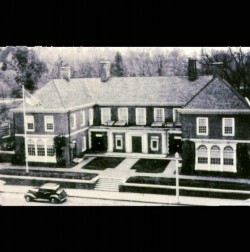 The current facility was built specifically for the Historical Society – construction started in 1917 and the Society took up residence in 1920. Over the years the organization has evolved to meet the ever changing needs of the community, and to apply the most current methodologies and technologies to the preservation and presentation of local history. The Peterborough Historical Society adopted the name Monadnock Center for History and Culture in 2013, to better reflect our role as a regional historical organization, and a multifaceted cultural organization.